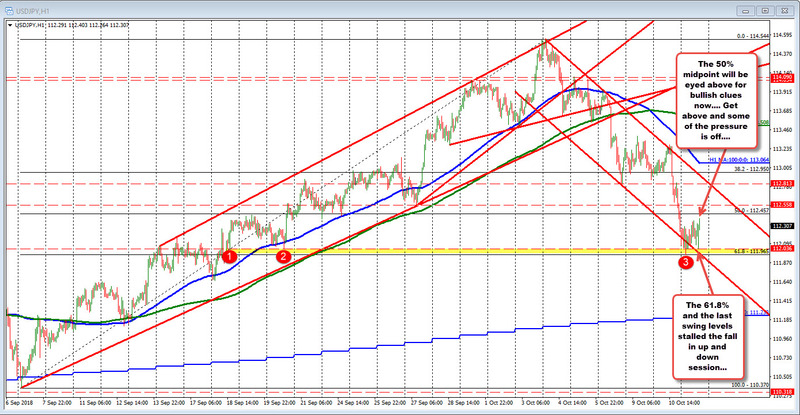 The USDJPY has been chopping up and down in trading today. The Asian low (as stocks there were getting creamed) reached the 61.8% of the move up from the September low at 111.965. Also in the area was swing lows from September 18 and September 20 (at 112.036). That low cracked below a lower trend channel trend line on the move lower but we are back into that channel (failed).. The rebound in London session (which moved to 112.36) stalled ahead of the 50% retracement of the same move higher. That level comes at 112.457. We trade nearer the high now - actually making new session highs now), after the post CPI low stalled at the swing lows at 112.036 (see yellow area). If you can't go lower, you go higher? JPY crosses (EURJPY and GBPJPY) are also moving higher perhaps anticipating a rebound in stocks. Watch the 50% level now (we just reached a new day high as I type) at 112.457. A move above, would be better technically for the pair. I kinda expect choppy to continue today as the market battles the thought that stocks are just too high.